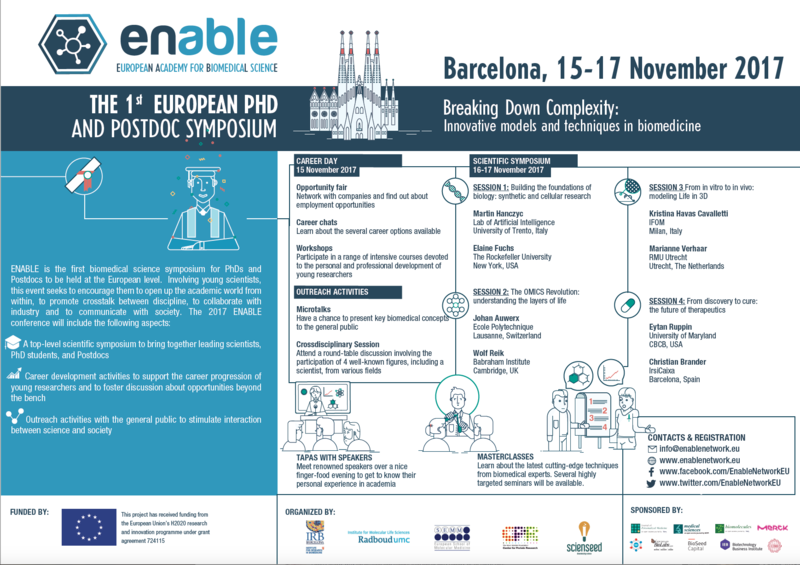 This is the 1st European PhD and Postdoc Symposium and it will be held in Barcelona from the 15th to the 17th of November 2017. The aim of this conference is to highlight recent advances and applications of modern techniques and models in biomedical research. The scientific programme covers a wide range of topics, from synthetic biology to translational medicine. The symposium is organised by PhD students and Postdocs from four international institutes and will feature lectures from eight renowned invited keynote speakers. About 300 participants, mainly PhD students and Postdocs, are expected to attend. The symposium offers top-notch scientific lectures as well as opportunities for young scientists to interact with established scientists during Masterclasses or the social ‘Tapas with Speakers’ events.